The definitive guide of things to do in Bologna Italy - What to see, drink, eat. As the temperature rose above 35 degrees Celsius, we could see the heat haze forming over the top of the terracotta coloured roofs. It separated the bright blue sky, turning it a cloudy, brownish colour and announcing that this was going to be one of those steamy, hot Italian summer days. Summer in Italy is a wonderful thing, and in Bologna, the capital of the Emilia Romagna region, the area’s largest city is brought to life. Despite having travelled around Italy quite extensively, Bologna had always eluded us. It always seemed to be just that little bit too far away from wherever we were to include in our itinerary. It’s always tempting for us to stretch more and include more, but still, it remained on the “to-do” list. Bologna should never be treated like we have treated it. It deserves attention! Located in the heart of Emilia Romagna, it is indeed a heady mix of culture, history, stunning architecture and of course food. It is its reputation for food that earns it the “food valley” of Italy tag, known worldwide for it’s commitment and traditions to creating authentic food dictated by regulations, restaurants and street food. There’s so much to do in Bologna and its surrounding areas that it needs time to be fully appreciated. We have stayed here twice now, both times for a week. If you only have a few days, then you can still make it a worthwhile visit. The best thing you can do in the centre of the Old Town is to put on your most comfortable walking shoes and traverse the streets and narrow, cobbled laneways. It’s hard to get lost here as the two towers that mark the centre of the town can be seen from almost everywhere. I loved getting up early and walking through the streets, long before the rest of Bologna had risen for the day. The streets are mostly silent. The whizzing and beeping of the Vespas haven’t begun for the day, and the hustle of the cars and buses as they fight for road space is absent. Instead, the sounds of steam effusing from the coffee machines, as the early risers head to the cafe for their morning espresso makes me smile. I shout out my best “Buongiorno” to anyone who passes, making them smile and me giggle as I look for my next passerby. If you can’t get up early, never fear, there’s still plenty of great times to be had. Tip: When you first arrive in Bologna it’s a good idea to head into the Bologna Welcome Visitors Bureau, located right on the main Piazza Maggiore Square. Here you can pick up a good map, showing all the key attractions and ensures that if you don’t use mapping apps on your smartphone then you at least have some help with direction. Tours, cooking classes and various other activities may be booked here or you can purchase the Bologna Welcome Card (more on that later). Bologna is well known for its cultural appreciation and this can be seen no more fervently than in the collection of museums. Depending on the museum, I can sometimes manage seeing one (or two if they are right up my alley), but Bologna is a museum lovers dream. At least 22 museums are located in Bologna, covering everything from music, industrial heritage, Jewish heritage, art, archaeology, tapestry and the world famous Ducati motorcycle. It will come as no surprise that the museum I enjoyed the most was the gelato museum in Bologna. Just off Piazza Maggiore, the oldest library in Bologna (Libreria Annani) sells hard to find and rare books. Bologna is a medieval city, with so much hidden beneath it and within the walls of the beautiful buildings. Bologna is a place where doing some research ahead of your visit will expose so much more than if you just read the popular guides or winged it. On one side of Piazza Maggiore sits the imposing building of the Salaborsa Library. Previously the city’s economic lifeblood, today it houses an incredible library. As one of the key meeting points in Bologna, its multi-stories are always abuzz with people. Enter through the front doors and look up. You will be welcomed by one of the most amazing art nouveau ceilings and arches you will ever see. The other surprise in this building lies under the glass bricks on the floor. Here, it is possible to see the archaeological remains of the city. You can do it in style with an array of free reading material and a coffee shop right next to it. Like museums, there are also many incredible basilicas to visit, many of them located in the centre of the city. The San Petronio Basilica, pictured below is the main church of Bologna, located right on the Piazza Maggiore. Inside a painting caused quite a drama many years ago from a religious point of view. Following the September 11 attacks in New York City, several attacks were also attempted here as a result of the painting. Now, as a precaution against future attacks, the church is guarded by members of the military at all times. The basilica is also known for two other reasons. Firstly, it is still incomplete. From the outside this is obvious with the lower half in marble and the upper part, still only brickwork. The church became a pawn between the church and the city of Bologna. The city wanted to build a church that was bigger than Saint Peter’s Basilica in Rome, but the Pope of the time didn’t agree. In response, they poured funds into the nearby university, allowing it to expand, and stymying the growth of the church. Eventually, after all the lost time and fighting, the money dried up and the church was never completed. Perhaps they achieved their wish after all, with the church still one of the largest in the world. This church is also famous for having the world’s longest sundial. The 67-metre sundial dates back to the 1600s. Inside the church, under the left nave, the sundial is inset into the tiles on the floor. It was designed and implemented by a professor with a love of astronomy. This sundial replaced one that had been in-situ many years earlier but had been destroyed. A hole exists in the ceiling, enough to let the light through. Look for a drawing of that resembles the sun and you will find the hole. When the sun comes through the hole, it hits the sundial and various time events can then be noted. The sun is meant to hit the dial at midday but I’m told that it isn’t always accurate. St Stephen’s Basilica sits on one of the nicest squares in Bologna. Not as well know or frequented as the main Piazza Maggiore, Stefano Square is special because it looks as though there are seven churches here. In actual fact, there are only three. Don’t make the mistake of just wandering through and around the Piazza Maggiore. Whilst the square itself is always full of life, late into the evening, there’s plenty of hidden gems too. Directly opposite the San Petronio Basilico is the Palazzo del Podestá. The building dates back centuries. Just to the right of the Bologna Welcome Tourism Office, an entry will take you inside and under the arched ceiling vaults. Long ago the markets operated here too. The walls here have some magical acoustic features and was said to allow lepers to come here to confess their sins. In later years, important city public servants would also come here to share confidential information. How is this possible? I can’t answer this scientifically, but if you go to one corner, and have someone else go to a corner diagonally opposite and whisper something into the wall, the person on the other side will hear it. It’s amazing. 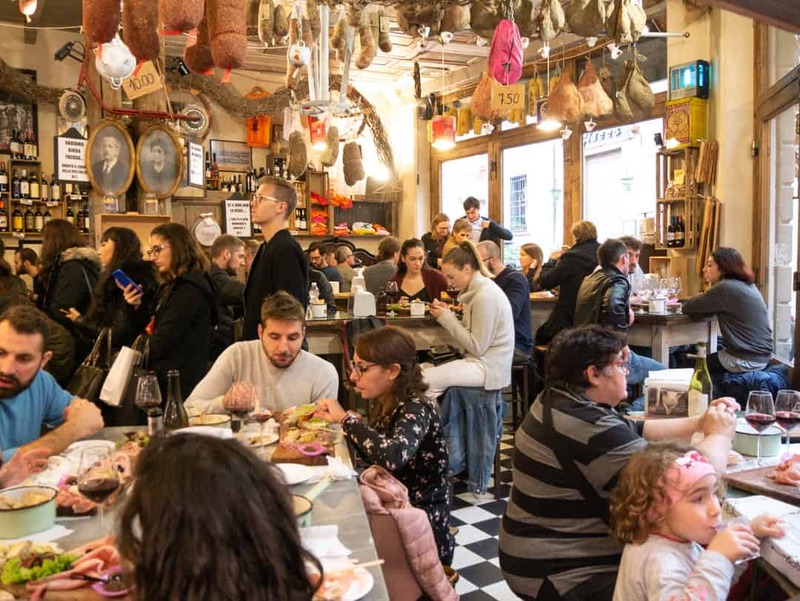 Nothing sets the scene for a city more than its central market, and in Bologna, the centre of the Italian food universe, you’d expect the market to be great. Whilst I am the first to admit it wasn’t as large as I thought it might have been, the quality of the fresh produce and other Italian foods at the Mercato Delle Erbe more than makes up for its lack of enormity. As I mentioned earlier, getting here as the market is just waking up is one of the best times to see it. It’s when the vendors are at their most active, unpacking their food and getting ready for the thrust of locals that will arrive soon. We took the time to savour the lack of people, hovering over bright red, vine-ripened tomatoes that my husband raves about. Soon after we find the tastiest of strawberries and grapes, then oranges to tuck our teeth into. Trying to buy one or two items in our best Italian is always challenging, but when the fruit makes its way into a brown paper bag and is handed to us, we know we’ve done ok. Buying food at a market is one of our favourite things to do if for nothing else, the smiles we get when we interact with them. Someone in the market is always willing to give you something to try. A little fruit, some bread, maybe some cheese. Try it all, the flavours are a sensation. In the old Quadrilatero, there are many gourmet food stores, small grocery stores and fresh fruit, vegetable and fish vendors. You’ll also find Eataly, a three-story haven for all things food, including a casual dining restaurant as well. Nearby the Mercato di Mezzo has a wide range of casual eating places too. They are particularly great for a quick bite to eat that doesn’t cost the earth or a cheeky glass of wine. Where: Mercato Delle Erbe can be accessed from Via Ugo Bassi and is open every day except Sunday. To make the most out of your time in Bologna city it is essential to look up. So much is going on around you and above you that to not look up will mean you will miss so much. In a city, so blessed with such a rich variety of offerings, it seems unfair that it could also be home to the most beautiful porticos in the world. They were built back in the Middle Ages to cater for a city bursting at the seams with people particularly academics and students. Initially built to extend the room of the house or apartment, clever people soon worked out that the covered area underneath could also be used. Whilst the explosion of porticos in other cities eventually lead to their demise through changes in town planning, those in Bologna not only survived but became a compulsory part of the new building code. Today, porticos in Bologna cover a length of nearly 40 kilometres. The portico that leads up the hill from the city walls to the Sanctuary of the Madonna di San Luca is almost four kilometres. The porticos are so much more than just a covered walkway. Not only are they great at protecting you from the blistering summer heat and the rain, but all of them are decorated and built differently, adding a uniqueness not found in most other cities. When you are finished looking up, climb the Asinelli Tower to look down and out. Providing one of the best views over the rooftops of Bologna, the Asinelli Tower is one of the twin towers of Bologna. The Garisenda and Asinelli Towers were once part of 100 towers that dotted the skyline of Bologna. Centuries after they were built, ruined, burned and left to crumble, only around 20 remain. The Asinelli Tower was built in the early 1100s. At over 97 metres high, it is easy to spot from many locations within the city, and from viewing points on the hills that surround Bologna. Inside, 498 winding, sometimes narrow timber steps will take you to the top. When you are nearby, you will also be able to see that it has quite a lean. The Garisenda Tower adjacent to it is much smaller. Sinking foundations required the tower to be lowered in order to preserve it. Only the Asinelli Tower may be climbed. Tickets may be bought online or at the Bologna Welcome Tourism Office located on the Piazza Maggiore. For accurate opening times, check the Bologna Welcome website. Alternatively, if you have purchased the Bologna Welcome Card Plus, then entry is free. Tip: In peak visitor season, if you don’t like climbing stairs behind a pile of other people, I recommend getting to the tower ahead of your ticketed time to get into the queue early. On the other side, if you think that climbing the stairs might take you a while, hang back so that you can take your time without others trying to get past. The stairs are narrow in parts and winding but there are landings where you can take a break if required. It gets really hot in there, hotter in summer, so it’s also a good idea to take some water with you if you can. It can get very busy on the top during peak times but the views are worth it. The view down over Piazza Maggiore. The orange building in between the piazza and the church dome is where we stayed in Bologna. If you don’t want to walk the 4 kilometres (uphill) via the portico up to the Sanctuary of the Madonna di San Luca, you can catch the San Luca Express bus that is available every day. Either way, make sure you get there. The building alone is fantastic, both for its design and its washed pink colour. We tucked ourselves up under one of the covered areas to escape from the sun and to take in the view over the familiar red rooflines and the forested areas. Bologna is a city meant to be walked. It’s flat in the city (the hills are surrounding it) so we rarely used public transport. It was only when we did the day trips that we needed buses and trains. However, if the summer heat gets too much, you have mobility issues, you have time restrictions, or you’re just plain tired, the City Red Bus will take you on a tour of all the key sights in Bologna. The bus operates like many of the “hop on hop off” buses all over the world and here you can do this as much as you like all day for the one ticket price. Audio guides are also available in eight different languages. Where else would taking a cooking class be such a cool thing to do? In the heart of the food valley, learn how to make perfect pasta, gelato or even pizza. If you can’t take a class, be sure to pop by any of the fresh pasta making stores to view the pasta being made. As is always the case with us, we love to see all the main areas in a new town but we love to find the not so common ones too. Bologna was once a canal city, with open canals visible up until about two centuries ago. Time has seen them built over or at least covered from view. We found one of the sneaky holes cut into the walls in a back laneway opening up the secret world of the canals. Where: From Via Samboni, towards Via Independenza go to the arcade of Via Piella. Look for a bright orange wall, with a round blue sign noting that you have found the Canale di Reno. Here you will see a square cut into the wall and when you look through it, the view below is what you will see. Near the main train station you can also see old ruins. Now whilst a church might not sound so different, I’ve included this one in here because of its location. In Bologna, there are two main places where everyone migrates to for a great view. As already mentioned, they are the top of the Asinelli Tower or the Sanctuary of the Madonna San Luca. For a different perspective, head to San Michele in Bosco. On a perfect day, you will get a great terracotta filled view. Ours was a little hazy but the view was still great. Can you see the Two Towers? The church up here is also worthy of a visit. Where: Located about a 15-minute walk uphill from the centre of the city. Alternatively, catch a bus from the centre (Via Rizzoli) that takes about 10 minutes. Bologna is so well placed and supported by excellent roads and public transport (especially trains) that taking day trips to other towns close by is very easy and something that should be considered to ensure you make the most of the Emilia Romagna region. Italy is so full of cliches that it sometimes feels hard to escape. But when the cliches mean eating great food and having an amazing time, who am I to get caught up in the details. Italy and Vespas are a combination like no other. Sure, you can ride scooters elsewhere, but there’s nothing quite like the thrill of being in a busy Italian city with Vespas scooting past you at often break-neck speeds. Whizzing in and out of cars, bikes and people, they are people on a mission and fully skilled having probably ridden on the back of one since they were children. In a university town such as Bologna, riding a scooter is the transport of choice. As a visitor, you don’t have to let the locals have all the fun. Hiring one is easy, or if you don’t feel up to it yourself, there are plenty of tours to tag along on. We went on an all-day vintage Vespa tour in Bologna, taking the bikes up into the surrounding hills. With the wind in your hair and some great stops along the way, it’s a day trip we highly recommend. About one and a half hours from Bologna is the town of Brisighella, known as one of the most beautiful villages in Italy. Whoever came up with this classification was right, with this ancient medieval city overlooked by the fortress known as “Rocca”, a church sitting aloft another hill and a 19th-century clock tower that you can climb. Along with beautiful buildings, some incredible history, cute restaurants and amazing views over the valley, it’s definitely a town worthy of a stopover. There are many wonderful places to eat within Brisighella itself. However, if you are looking to add to your experience here, we wholeheartedly recommend a visit to the DonnaLivia Agriturismo. Here you can visit the olive production facility, wander through the vineyards, see farm animals, have an amazing lunch prepared with their own fresh produce and even stay the night if you wish. Also only just over an hour away (except for weekends when everyone from Bologna flocks to the seaside), is Rimini. Built right on the Adriatic Sea, it is a beachside resort packed in the summertime with umbrellas, lounges and of course people. To many, it can appear sometimes tacky, but for those who are simply wanting to break away from their city life and catch some sun, this is just the place. As an Australian, we are blessed with many beautiful beaches but they are never dressed up like they are in Europe and South America for example. Our beaches are just the sand and the people, perhaps with their own makeshift tents and umbrellas. Seeing beaches like this always seems like something out of a fairytale to me! There’s plenty to see in the Old Town and if you are a fan of the film director Federico Fellini, there’s a strong presence of him here. We’d never heard of him but that’s not surprising. If there is one place that we think you should definitely try to see when you are either based in Bologna, or in its surrounds, it would be the tiny country of San Marino. Completely landlocked by Italy, it is one of the smallest countries in the world and packed full of things to see and do. Unfortunately, because of its location and because it really is a place where you only need to spend two days maximum, visitors don’t tend to go here for this country alone. Don’t miss visiting San Marino – read here to find out why! Agriturismos can be found all over Italy, but Fienile Fluò sets itself apart from the usual agricultural flavour of most of them. Built on a vineyard, wine tasting is a common activity, but owner Elizabeth has built this business into so much more. With an intimate dining setting outside overlooking the surrounding countryside, partaking in some of their fresh produce and local wines is just the start. Take a walk through their property, stay in their accommodation and be sure to check out their monthly calendar that offers outdoor movies and other food events. FICO World Eataly is the largest agripark in Europe covering 12 hectares. 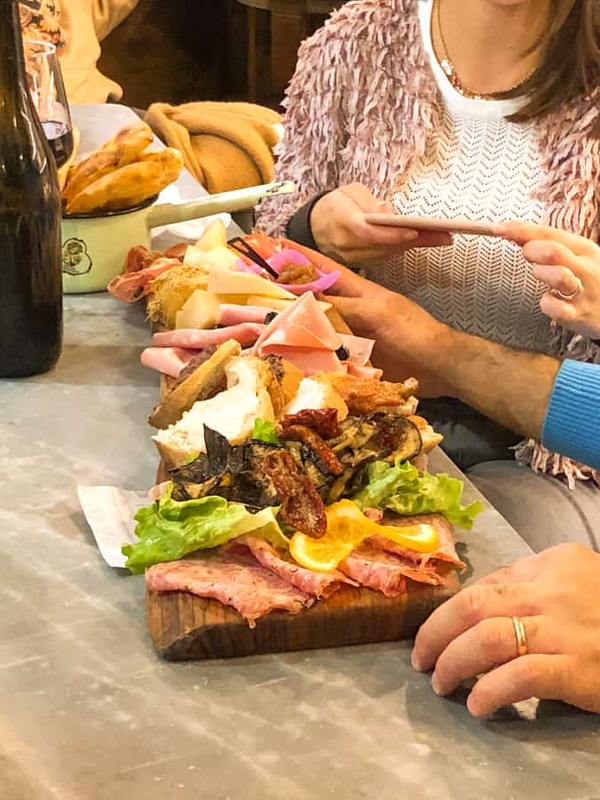 Whilst it might sound like a strange thing to list as a day trip from Bologna if you are a serious foodie, or just love to eat, you can keep yourself occupied all day here. Whilst some locals and true food lovers might argue that this is over-commercialised, it is still the largest offering and showing of major brands and producers in Italy under one roof. For visitors, this is perfect, especially if you are short on time. You can taste your way around the huge area, learning about traditional and authentic Italian foods. you can buy products to take home with you, and it’s an awesome place to bar hop and try different foods. Should you need some help getting around, there are bikes (Bianchi of course) to help you traverse this extensive place. Only a little over an hour away from Bologna is an area that scored the jackpot when it comes to authentic Italian produce. In and around the city of Parma, three undeniably Italian products are made according to the strictest of standards. It is here that you can learn, once and for all, that parmesan cheese, balsamic vinegar and prosciutto are not made equally. So many people are unknowingly ignorant to the secrets of eating “the real deal”, buying lookalikes and representations that taste ok, but never coming close to the true product. It is only when you watch and learn the process, and then taste the authentic products that you can truly understand the difference. I can’t believe that so few people know about Ferrara. Only a short train ride from Bologna, it’s perfect for a day trip. Rich in history, beautiful buildings and more great food, it’s one of the best cities in the Emilia Romagna region to visit. 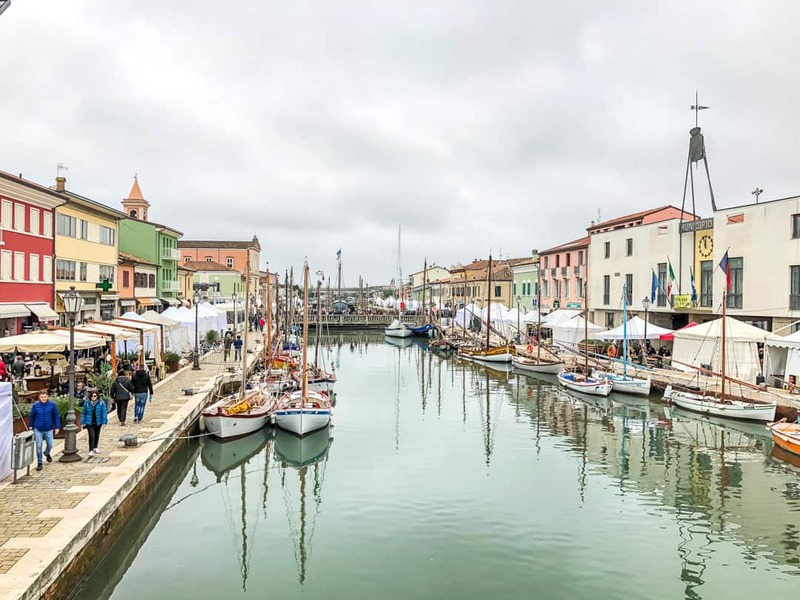 If you are visiting San Marino or Rimini, why not make a stopover in Cesenatico too. An old fishing town, it’s one of the most popular seaside towns in Italy. If you are visiting in late October or early November, be sure to check out the annual fish festival, il Pesce fa Festa. It’s awesome. Visiting Bologna is all about the food! It’s a rite of passage and it’s one of the major reasons for coming here. The food is regional, it’s delicious and it’s made with so many regimented traditional processes that you just know you are getting the very best on offer. So what should you try here? It just wouldn’t be right if you didn’t eat pizza at least once during a visit to Italy. I’m always happy to argue on this one, but my position has and always will be that the best pizzas in the world come from this country. Sure, like anywhere, you can get bad ones here, but in general, they are outstanding. Equally, of course, we’ve eaten some good pizzas in other locations all over the world, but I’m holding firm on my opinion. The very best pizzas in Italy, of course, are those that are made with a few simple ingredients and a thin crispy base cooked courtesy of a traditional wood-fired oven. It’s always hard to make recommendations for good pizza places. We found our eating spot by taking to the streets and hidden laneways, looking for pizzerias that were busy and frequented by locals. It’s even better if there isn’t an English menu or photo of the food plastered on the windows, a sure sign that this is the real Italian food. Note: We visited this pizzeria again on our second visit and it still didn’t disappoint. Fast service, cheap pizzas and plenty of nighttime activity in the laneway. Ok, so there’s not really many words needed to explain this. 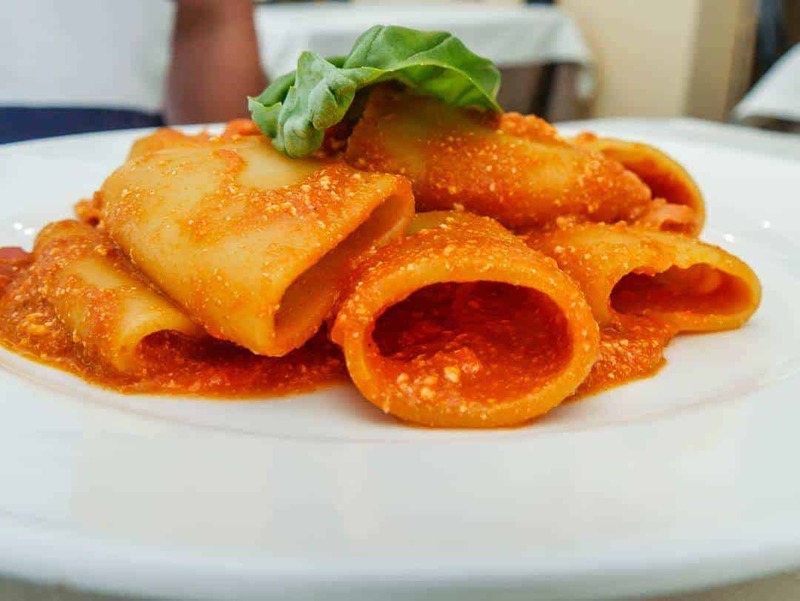 Suffice to say, not all pasta is created equal, and in Bologna, there are certain kinds of pasta that you won’t find anywhere else outside the city or the region. 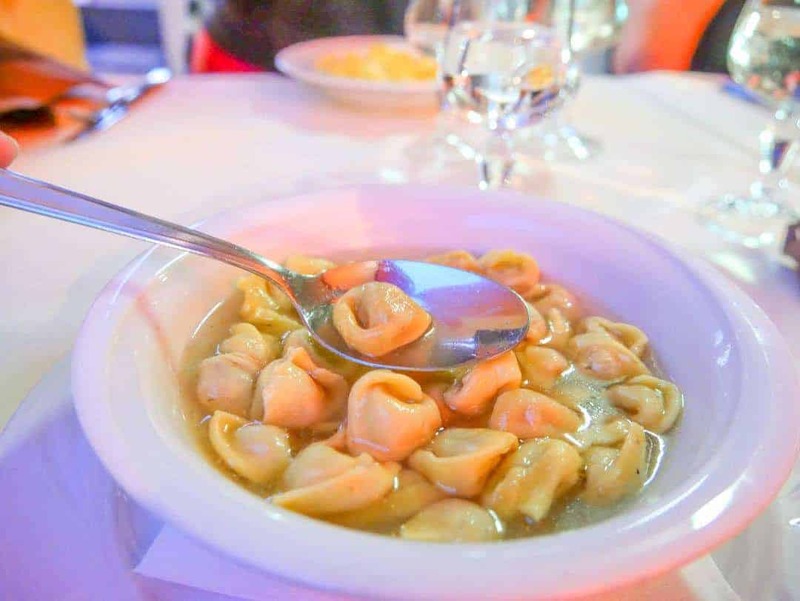 Tortellini en brodo is one of their special pasta dishes. A simple mix of meat, mortadella and ham usually fills the freshly made pasta and it is served with a light chicken broth. Watch our video above to see us making this dish with a local in Bologna. We hunted down a traditional lasagne verde, made with lasagne sheets coloured with spinach. 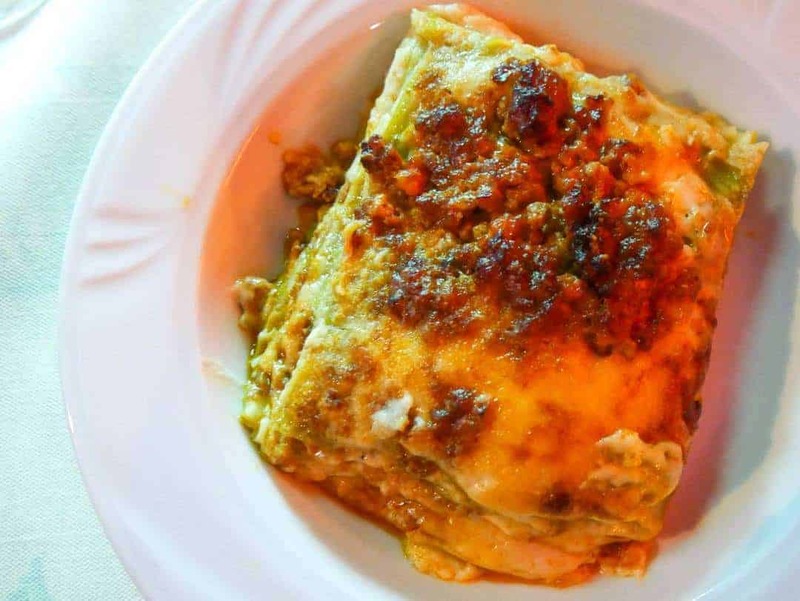 The Bolognese are very particular about their lasagne too, paying close attention to a recipe that sees layers and layers of soft pasta sheets, rolled very thin, layered with the meat and not lashings of sauce, ricotta or mozzarella. The paccheri pasta (large tubes) covered with fresh tomato, prosciutto and smoked ricotta cheese was amazing. I, however, was very happy with my oh so soft lasagne. Just when you think you can’t possibly eat more pasta, the city of gastronomy offers up more regional delights. This time we took time out in a small shop hidden away just out of the main city areas, but still easy enough to walk to. La Bottega was one of our favourites as it was not only a place to eat but a place to buy Italian food products. At night, the small bar inside plays hosts to a small group of visitors who come to eat quality antipasto and have a drink. Here we tried two more meals unique to the area, made up by Nonna who was working hard out the back to prepare our meals. 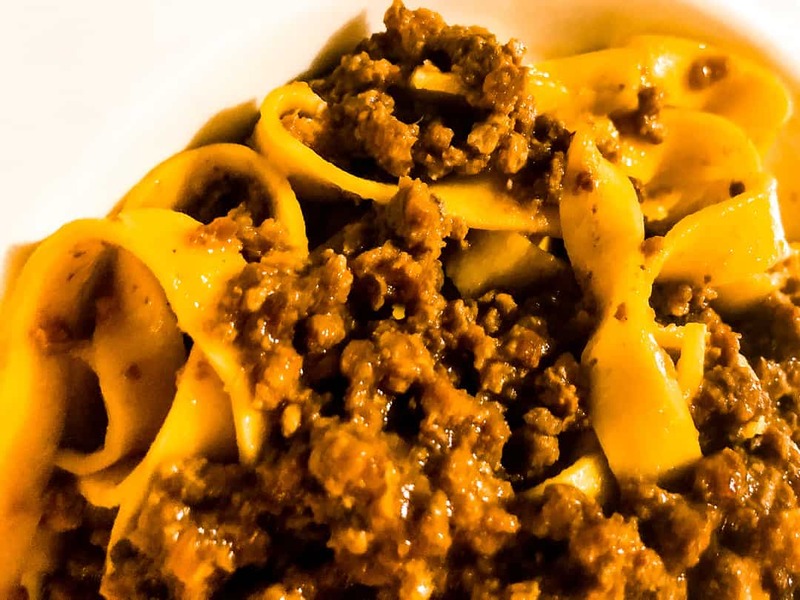 The famous ragù alla Bolognese, of course, comes from Bologna. A simple meat sauce full of fresh ingredients and cooked low and slow for many hours. It’s a great example of how pasta doesn’t need to have multiple ingredients to be tasty. I had this with tagliatelle. Another local pasta is Gramigna with ragù di salsiccia, a locally made sausage. If you are looking for pasta, in enormous portion sizes, without any fuss, then Adesso Pasta Car Ristorante is a good choice. Located not far from Piazza Maggiore, in a building once occupied by Bologna’s leading curtain manufacturers, it’s clean, modern and quick. The food is also good. Just a tip, don’t order the large size unless you are seriously hungry. Trattoria Tony is also a must visit if you want to eat where the locals eat. But, be warned, Tony’s is popular, so be sure to book in advance. La Montanara, another traditional trattoria is also close by, but the service there was a little on the rude side. If you walk just a few more metres, you’ll find La Montanara Bistro which is cute, funky and the service is so much better. Note however it does not have pasta. Across the road, Swine serves up good Italian food, cheap house wine (but it’s not on the menu so you have to ask for it) and has a nice cosy feel inside. If there’s one thing that I love when I’m in Bologna, it’s piadina. A thin flatbread is served up with simple fillings. For some great takeaway, head to La Piadeina. Pasta Fresca Naldi, run by longtime Bolognese resident Valeria has some of the best fresh pasta in the city. In a small, nondescript shop, they work tirelessly preparing fresh pasta for the crowd that comes to buy it and take it home to cook. In the centre of the city, Le Sfogline is a trendier version but nonetheless produces good quality pasta for takeaway. For a mix of restaurant and takeaway, try Sfoglia Rina. If the crowds are anything to go by, then it should also be on your eating list. More chain-looking restaurant than old-school trattoria, it serves pasta that it makes in house. You can also buy pasta and take home. Note: Many of the restaurants and cafes in Bologna city don’t open till at least midday and it is always advisable to book, especially the traditional trattorias, to avoid disappointment. There are so many great cafes selling equally good pastries around Bologna and there is no end to the amount of coffee and espresso bars you can find. Two of our favourites are the Gran Bar and Impero Bar. Make sure you try the bombolone and the cornetti. Both come filled with various fillings like chocolate and Nutella. My favourite is the custard. Two of our great loves in this wonderful city of Bologna. Sitting in a busy alleyway, eating prosciutto, salami and cheese whilst sipping a glass of wine or indulging in an Aperol spritzer is one of life’s great pleasures. Fortunately, in Bologna, there are plenty of places and opportunities to do this. Porchetta, the rolled, roasted loin of pork with intense crackling is another offering you should not miss. We found a great place to combine all three treats of wine, prosciutto and porchetta. At La Prosciutteria, you can sit inside the small space, sharing tables and quite possibly food with your neighbours. As you line up inside to place your own order I can guarantee that you will change your mind on more than one occasion as you see the fantastic food coming from behind the counter. Outside, a few tables and chairs that look more like they are for children than adults provide the perfect spot to attack a large focaccia that is overloaded with porchetta. For €5, this lunch will keep you going for the rest of the day. For a fun vibe and awesome antipasti head to Simoni in a laneway off Piazza Maggiore. The whole laneway here buzzes, especially at night. Trust me, we stayed in an apartment right near here and the noise at nighttime is unbelievable. The Simoni family have been involved in the production of traditional smallgoods since the 1960s. Today, they operate a manufacturing business in the Quadrilatero, once the medieval market in Bologna. They also operate a booming business nearby, serving the finest meat and cheese. On the numerous occasions that we either ate here or walked past, there were never too many seats sitting idle. Whilst sitting outside is my preference, you can sometimes find seats hidden inside. It’s always a good idea to check. We had excellent service here and they were only too happy to talk to us about what we were eating and to give us some samples to try. Whilst there is no shortage of places to eat in Bologna, it is also very easy to self-cater. Whether you are trying to save money, or just downsize the amount you are eating, there is so much wonderful food on offer. Prosciutto, salami, Parmigiano Reggiano cheese, bread and fresh fruit and vegetables are in abundance. See above for some of the best places to buy fresh food. It’s simple. You must do this. You must eat as much as you can. There is no gelato anywhere else like it in the world. Be sure though to eat artisanal gelato if you can. You can identify it very simply. There will be no brightly coloured, artificial looking mounds of product on display. Instead, you will see stainless steel cylinders with their lids on and a menu board. You buy by choosing from the flavours not by looking with your eyes. Artisanal gelato is more natural looking as well, given its lack of artificial colours and flavours. One of the best is the small shop run by four young men at Forno Brisa. Be sure to check it out. The Italians love to have a drink with all meals, but it is the aperitivo hour that draws out the crowds. In the summertime, with daylight lasting well into the evening, the mood turns into a happy vibe as locals and visitors alike swamp the bars for an afternoon drink. For some, it’s a chance to unwind after a long day at work and for others, it’s the gentle slide into dinner. In Bologna, they do aperitivo time in style, adding a buffet of tapas-like finger foods to the cost of your first drink, for anywhere between €5-8. We pulled up a high chair at Bar Igea just off the main Via Indipendenza under the light mist of the water being pushed out from overhead fans designed to keep their guests cool. Our favourite spots are in the laneways off the Piazza Maggiore where the bar culture is alive and well. Try heading down Via Pescherie Vecchie for some great bars. Drinking espressos is part of everyday life in Italy. 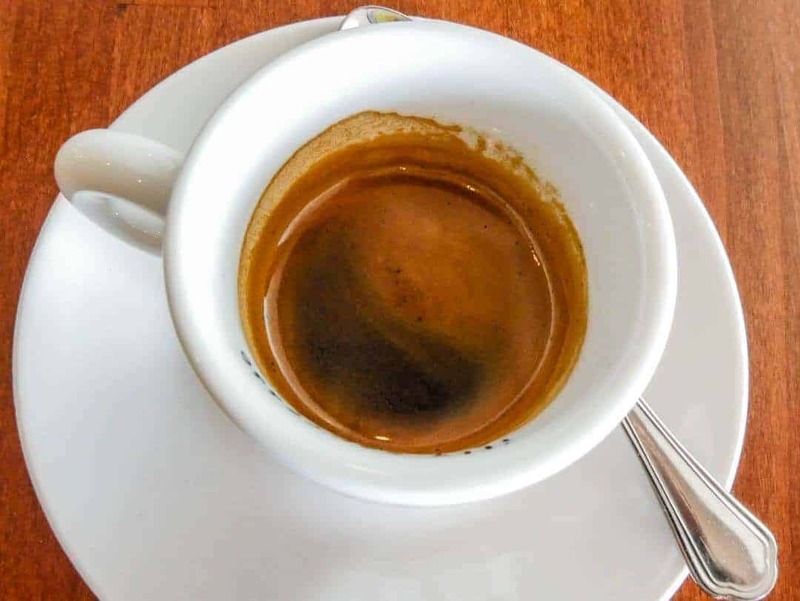 Pop into one of the many bars, cafes and holes in the wall for a €1 stand up espresso. We have stayed in apartments on Via Indipendenza, one of the main streets in the centre of Bologna and Via Clavature, just off Piazza Maggiore. From both locations, there is easy access to the central train station, to the public bus network and within walking distance of everywhere. Alternatively, there are many hotels here to satisfy every budget. Grand Hotel Majestic Gia’ Baglioni – Located right in the centre of one of the main city streets, this luxury hotel gives you access to everything you need in Bologna. Astoria Hotel Bologna – Access to all the main attractions and places to eat make this three-star hotel a good choice. Click on the link below to bring up a range of hotels and apartments in Bologna. If you are planning to stay in Bologna for only one or two days, the Welcome Bologna card might be perfect for you. You can choose from a €25 or €40 card. They provide entry to the most-visited museums in Bologna, a walking tour of the city, tours of the Asinelli Tower, and the City Red Bus, maps and entry to current exhibitions. For more information, check out the Welcome Bologna website. Bologna is serviced by Guglielmo Marconi Airport, approximately six kilometres from the city. Many airlines fly here, including low-cost European airlines. We flew from London Gatwick to Bologna in two hours via Easyjet. The Aerobus operates from the airport to the city at regular intervals. Tickets for €6 can be bought from the machines just outside the arrivals hall. The bus takes about 20 minutes to get into the city, dropping everyone off at the Bologna Centrale Train Station. Bologna also has a major train station, providing access to regional and fast trains. The train station is located in the city and makes access to hotels easy. Remember to validate your tickets before getting onto the trains. The public bus system is inexpensive and easy to use here. Tickets can be bought on the bus or at tabachis/newsagent. We all have different reasons for wanting to travel at different times of the year. June through to August is peak tourist season in Bologna. With this comes the associated crowds, higher prices and the heat. If these things don’t bother you, it’s the perfect time to be visiting here, with long days and everything accessible and open. Note: Europeans go on holidays in August, so the city is likely to be less exciting as it is in June and July. As the heat comes out of the summer days, the shoulder season of Sept – October is a particularly nice time to visit. Plan your own itinerary based on our ideas using the free trip planner. Sign up for free to save your plans so you can work on them. Looking for some great reading material for Bologna. Click below for more information. Beer and Croissants would like to thank Emilia Romagna Tourism and Blogville Europe for helping us to deliver an amazing itinerary in Bologna. All editorial content is completely independent and all thoughts and opinions are our own. Bologna seems so picturesque and a great place to explore. Your pictures have left me speechless. I would love to explore those markets there. How many days would be enough to see all the highlights there? Hi Agnieszksa, If you weren’t planning on doing the day trips, I would still want to spend at least two full days here, three if you could stretch it. That way you wouldn’t have to rush, could take time to explore all the great food places too. Wonderful articles and photos of Bologna and surrounding areas. Every aspect covered. I was interested to read about Frederick Fellini’s presence in Rimini – I stayed at the Hotel Fellini in Rome about 3 years ago. I loved the clock of the Banco di Roma under one of the porticos. I’d love to see more of that region. Maybe one day! It’s a wonderful area that’s for sure. How amazing that you stayed at that hotel too. I thought maybe you might have seen some of his movies too ? It’s been a long time since we last traveled in Italy, but Bologna makes me want to pack and go! And plenty activities and things to do to shake off all the food! Awesome post, now I’m hungry. We were just in “Bologna” for a few days a couple of months ago (really the outskirts) and never actually made it into the city. We did go to San Marino though! Your post makes me want to go back! Bologna is one of the cities in Italy with the best food but sometimes people tend to forget how beautiful it is: not just food but also narrow streets and historical buildings. Thank you for this article, I loved reading it! I fell in love looking at the pictures from Mercato Delle Erbe because of all the cheese—heaven for me! And way better than the people let you have little samples; always a guarantee for me to purchase something! I like that you suggested San Michele in Bosco as a different place to get a gorgeous viewpoint! Stunning photos! They really bring Bologna to life. It’s funny, just last week a friend of mine mentioned she was planning to visit Bologna over the Easter holidays and it made me realize that I really knew nothing about the city…until now! From your post it looks like there’s plenty to see and do (and eat! ), I’m forwarding this along to her! I was just saying to my friend I reeeeally need to visit Italy – like ASAP! I also watched Master of None (with Aziz Ansari) and one of the episodes in season 2 was filmed there. If I go to Bologna, I’ll refer to this post cause it has great information for itinerary planning! Super, super extensive and well-written guide! I especially loved the description of the market – you took me back to when I lived just outside Bologna a few years ago. It’s so great to see that such an underrated city is getting recognition. Although, somehow in my year of living there I never knew about the Canale de Reno! The day trips are also must-do’s, especially Brisighella. Wow, so many things to see and do! I’ve just watched Chef’s Table tonight and the first episode was about Italian cuisine. I have yet to try pasta in Bologna. An extended visit to a basilica would be rewarding, too! Ha Bologna. It used to be my favourite city when I was a student, back in the 80s. The university is the 3rd most ancient in Europe. I still love Bologna, I actually like it better than Florence (sorry guys). And yes the food is one of the best you can get in Italy. All round a great place to visit in North Central Italy. Thank you for a great blog. I’m going to Bologna next week to brush up my Italian on a week’s language course. Your ideas and photos have whetted my appetite in every way. Can’t wait! By the way I’ll be on my own & wondered if you had a feel for how it might be for me to eat and drink alone (with a book of course!) in bars, cafés and restaurants? You will love Bologna and how amazing to be going to improve your language skills. I love that! Bologna in the city centre is extremely safe and you will have no problem at all being alone in the cafes, bars and restaurants. Having a book or device always lets people know you’re happy to be alone anyway, but you’ll be perfectly fine. Enjoy! HI Ramona, Bologna isn’t particularly known for prosecco at all although you will find it all over the bars here. It’s is often mixed with aperol for a spritzer in the afternoon.